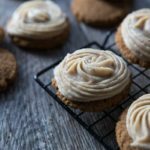 These Whole Wheat Pumpkin Sugar Cookies may just blow your mind! In the cookie there is NO refined sugar! Not only that, they are DELICIOUS! Of course, I did top them with a classic cream cheese and together they are a match made in heaven! Added some pumpkin flare to make them great all fall long! 1¼ c. coconut sugar + ¼ c.
In a medium-sized mixing bowl, mix together flour, salt, baking soda, and cream of tarter; set aside. In the bowl of a standing mixer, cream butter and both granulated & powdered sugars together for 2 minutes until fluffy. Add pumpkin puree and slowly stream in the oil while beating. Add vanilla and then beat in the eggs one at a time until well combined. Slowly add the flour mixture to the wet ingredients, mixing until combined (scrape down the sides of the bowl as needed). Roll dough into 2 inch balls to make approx. 36 cookies. Place ¼ cup coconut sugar in a small dish. Place rolled dough on a baking sheet about 3 inches apart. Using a drinking glass (or something that is 2.5 inches in diameter), dip into sugar. Press the glass into a ball of dough until it is ½ inch thick. Repeat the process of dipping the glass into sugar and pressing it into a ball of dough. Bake for 8 minutes only. Gently remove cookies from pan onto a cooling rack and let them cool completely. For your frosting, in the bowl of a stand mixer, beat softened cream cheese. Add heavy whipping cream, pumpkin pie spice, & vanilla. Slowly add powdered sugar until you reach your desired consistency. Add more powdered sugar as needed. Add additional heavy whipping cream 1 tbsp. at a time as needed. Frost cooled sugar cookies. For powdered coconut sugar I simply put my granulated coconut sugar in my blender and blended until fine powdery consistency.